FREE-SAT™ 7″ x 7″ 70% IPA / 30% DI Water – These wipes contain four clean-cut edges as opposed to having long, stringy loose fibers on two sides due to perforating. 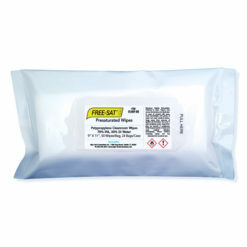 FREE-SAT™ IPA Pre-Saturated Wipers are packaged in convenient containers which allow the user to open, remove a wipe, and close the container with one hand. This enables the user to hold an item with the other hand. Because the block of 100 isopropyl wipes are pre-saturated in tough sealed nylon bags within the container, shelf life is dramatically increased. The fabric itself, NOVA-TECH 1000™, is a material that is tough, abrasion resistant and virtually free of particle generation and extractable chemical. It is comprised of a synergistic blend of virgin polyester and cellulose that is hydro-entangled into a uniform tough fabric. These unique features make NOVA-TECH 1000™ a very effective fabric for isopropyl wipes. IPA/DI Water aids in the removal of solutions such as disinfectants, adhesives, residues, etc.